Make tracks with the Sit to Stand Alphabet Train, teaching little ones letters, numbers, colors, songs, stories and more. 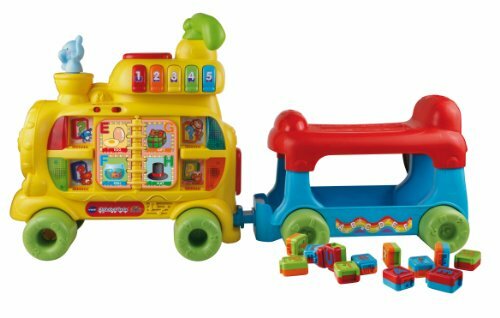 The Sit to Stand Alphabet Train features 13 double-side letter blocks, a book with six turning pages, five colorful number buttons, one movable elephant character, a motion sensor, a ride-on carriage and a drop-space for sending the blocks from the train to the carriage. You can use alone for floor play, push along as a walker, or attach to the carriage as a ride-on toy. Plus, with the Sit to Stand Alphabet Train, there are two ways to play. Choose from two play modes: Walker Mode and Discovery Mode. Product Meausres: 10" x 31" x 7"